Senior Day in the Park is a one day event during the month of May where our communities come together to celebrate local senior citizens. It's the social event of the year! In collaboration with the Kings/Tulare Area Agency on Aging (K/TAAA), CSET is proud to present the 50th Annual Senior Day in the Park! 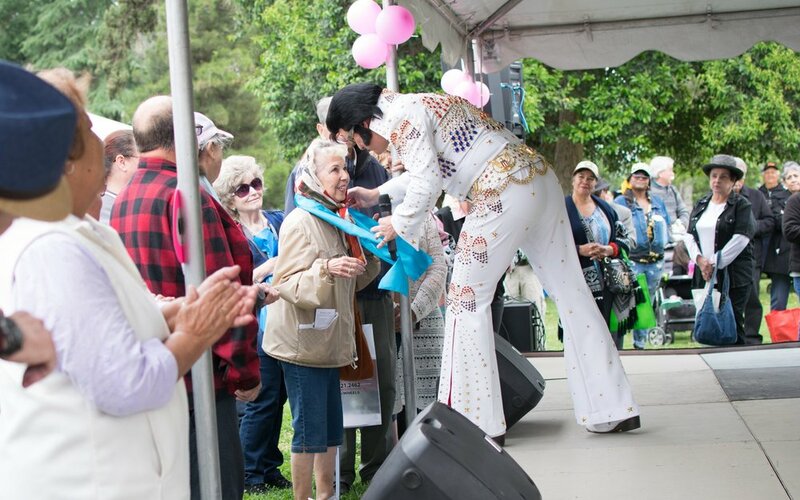 This year, we will be celebrating seniors by throwing a golden anniversary bash with an exciting lineup of activities and entertainment including a classic car show, local music groups, and a visit from “Elvis” himself! A delicious lunch is also available to seniors and their guests. Exhibitor booths from local agencies across Tulare County will be present and are always a big hit with our seniors. Agencies are invited to showcase their programs and services to more than 1,500 older adults and family members who attend each year. Do you want to showcase your agency at the 50th Annual Senior Day in the Park? If so, please click on the button below to download the Exhibitor Packet for full event information. Ready to register now? Great! Scroll down to complete your reservation. We hope to see you there! Many local businesses and agencies support Senior Day in the Park through monetary contributions, which may be tax deductible, or by the in-kind donation of items. By becoming an event sponsor, your company or organization becomes a community partner in the effort to celebrate local seniors. To learn more about becoming a sponsor, please download the sponsorship letter by clicking on the button below. Download the event flyer and share it with every local senior you know! Their families and caregivers are also welcome to attend.